In simple terms… You can lose belly fat by combining a healthy diet and the right exercise routine in the gym. The deadlift is one of the best exercises. It works your entire body, especially the legs, core and upper/lower back. 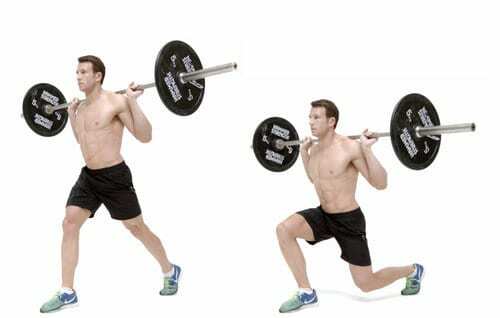 Stand behind a barbell which is grounded and bend your knees slightly so that you can grab it. Ensure that your back is straight and core is tight. 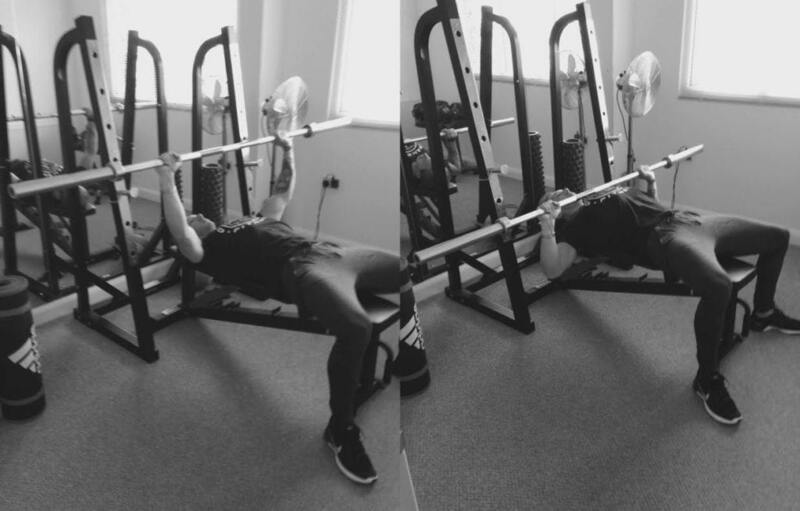 Then whilst contracting your legs, stomach and upper back…Lift the bar straight up, while pushing your hips forward. As you do this, don’t bend your back. You’ll now be stood up straight. From your upright position, push back your hips and bend your knees slightly to lower the bar back to the floor before doing your next rep.
Find a flat bench and lie on it. Grip the barbell in the rack with an overhand grip which is shoulder-width a part. With your arms extended fully, lift the bar off the rack, then start to slowly lower it to your chest. Inhale as you lower the bar down, stop one inch above your chest, pause for a second, then contract your chest hard as you push the bar back up to the top position. Then repeat your next rep.
Place a barbell on the back of your shoulders. Stood up straight walk forward (about 1 metre) with your right leg, then slowly bend your right leg until it bends to 90 degrees, from this position push up using your right leg, whilst walking forward with your left, then repeat with your left leg. You can do walking lunges, or static lunges if you have less space. The DB bent over row is a great exercise for working the upper back. Using a bench to support your body, pick up a single dumbbell and row the weight up towards your lower stomach. Make-sure to keep your core tight and pull using your mid back (instead of your arms). A great core exercise! Lie on your back with your knees bent to 90 degrees and arms crossed over your chest. Tense your abs and start to sit up straight, one you get to the top, pause, and contract your abs for 1s before slowly lowering yourself down to the starting position. This is a great exercise if you want to target belly fat. One of the best full body movements, it literally targets everything: legs, arms, core and gives you a great cardio workout! Start in a standing position, squat down, place your hands on the floor (shoulder width apart) jump back until you get into a push up position, then jump back in and finally jump up straight. Then repeat! Place your feet just outside of shoulder width. This will create a wide stance where you can get deeper squats that activate your hamstrings and glutes. Rest a barbell across your upper back muscles. Squat down slowly with the weight of the bar. Keep your head up, bum out and back straight. Once you get to 90 degrees pause for 1 second, then contract your thighs, glutes and hamstrings hard as you push the weight back up to the top. Start in a deadlift position, pick the weight up like you would a deadlift, but when you get to the top of the deadlift start to lift the bar up towards your shoulders, pause for a second at the top and then press the weight above your head, before reversing the rep back down into the starting position. 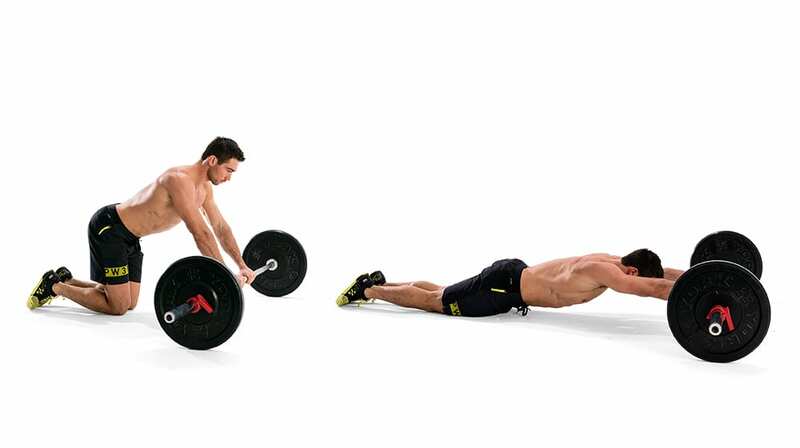 A super fat burning exercises that hits the chest, shoulders and triceps. Start so your arms are straight, then slowly bend your elbows and lower yourself to the floor (like in the image above). Keep you abs tight and then use your chest and arms to push you back to the top position. Load 5 kilogram plates on your barbell. Keep your arms shoulder-wide and grab the barbell using an overhand grip. With your shoulders right above the barbell, roll the bar forward. Pause at the most extended position and then reverse back to the starting position. 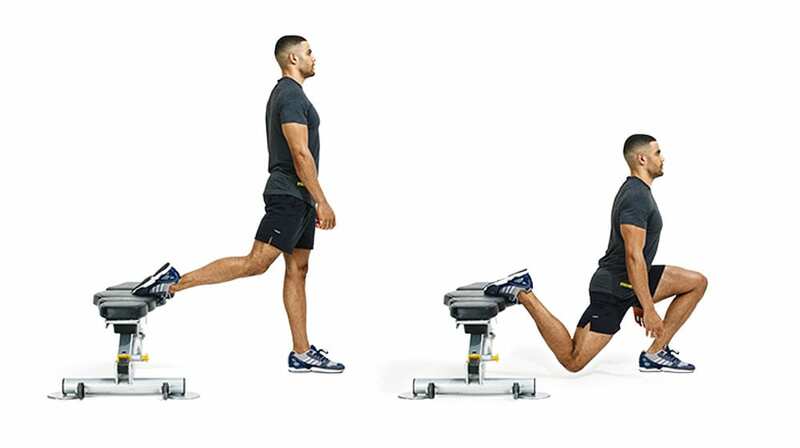 Very similar to the lunge, however you place your back leg on a bench (see image above). Also instead of walking forward like with a lunge, you stand in one place, lowering yourself on one leg to 90 degrees before pushing back up to the top. Do 10-15 reps on your left leg and then switch to your right side. Grab the pull up bar. Use your upper back and arms and pull up until your head is above the bar. Hold at the top for 1 second before slowly lowering your body back to the original position. Repeat! Sit on a rowing machine with your feet fastened in tightly. Pull back the row handle, pushing with your legs and pulling with your arms. 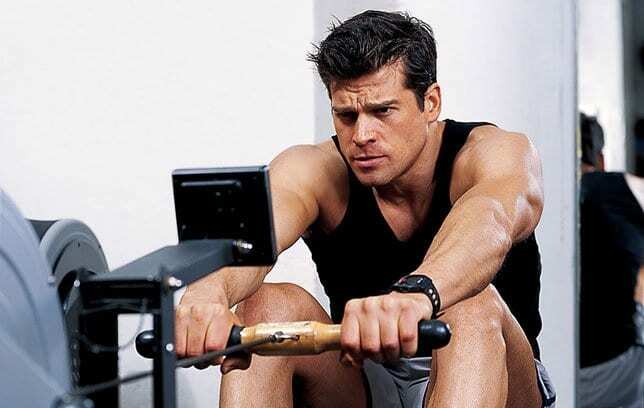 Once you’ve completed the row and your legs are fully straightened, slowly bend at the waist, straighten your arms, and then bend your knees as you row back to the starting position. A great cardio workout for the arms, and core. 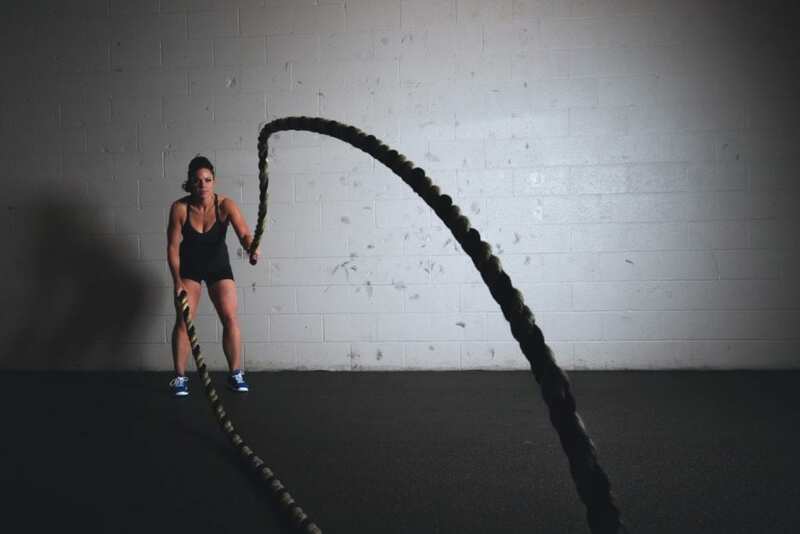 Pick up some battle ropes (which are anchored into the ground) or wrapped around a squat rack. Pick up each side of the rope, one with your left hand, the other with your right hand, then start to do a drum roll as quick as you can!